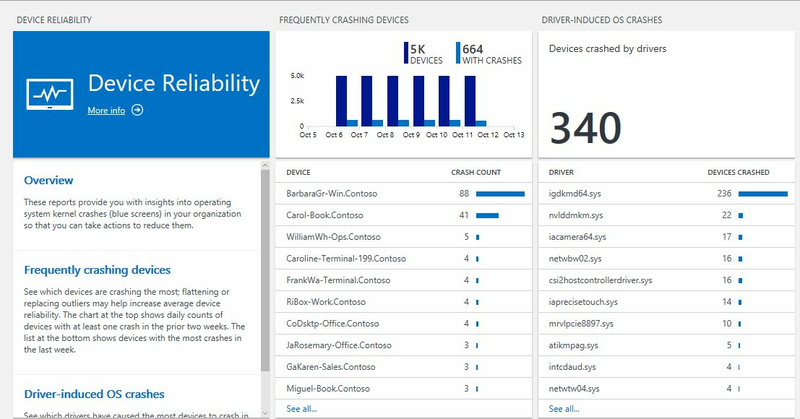 This section describes how to use Device Health to monitor devices deployed on your network and troubleshoot the causes if they crash. Device Health provides IT Pros with reports on some common problems that users might experience so that they can be proactively remediated. This decreases support calls and improves productivity. Information is refreshed daily so that health status can be monitored. Changes will be displayed about 24-48 hours after their occurrence, so you always have a recent snapshot of your devices. 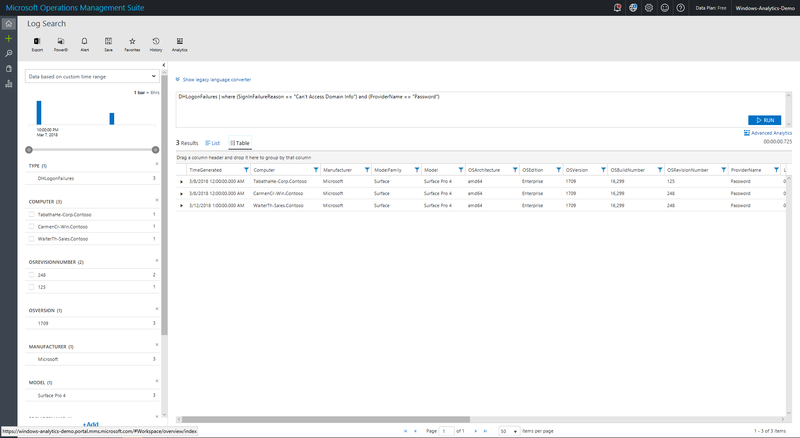 In Azure Portal, the aspects of a solution's dashboard are usually divided into blades. Blades are a slice of information, typically with a summarization tile and an enumeration of the items that makes up that data. All data is presented through queries. Perspectives are also possible, wherein a given query has a unique view designed to display custom data. The terminology of blades, tiles, and perspectives will be used in the sections that follow. This middle blade in Device Reliability displays the devices that have crashed the most often in the last week. This can help you identify unhealthy devices that might need to be rebuilt or replaced. "Commercial averages" here refers to data collected from deployments with a mix of operating system versions and device models that is similar to yours. If your crash rate is higher, there are opportunities for improvement, for example by moving to newer driver versions. Notice the filters in the left pane; they allow you to filter the crash rate shown to a particular operating system version, device model, or other parameter. Use caution when interpreting results filtered by model or operating system version. This is very useful for troubleshooting, but might not be accurate for comparisons because the crashes displayed could be of different types. The overall goal for working with crash data is to ensure that most devices have the same driver versions and that the version has a low crash rate. If you click through a particular device from the view blade or from the Device Reliability perspective, it will take you to the Crash History perspective for that device. Crash history records by date, aggregated by Failure ID. The Failure ID is an internal number that is used to group crashes that are related to each other. Eventually over time, you can use the Failure ID to provide additional info. If a crash was caused by driver, some driver fields will also be populated. StopCode: this is hex value that would be displayed on a bluescreen if you were looking directly at the affected device. Count: the number times that particular Failure ID has occurred on that specific device on that date. This blade (on the right) displays drivers that have caused the most devices to crash in the last two weeks. If your crash rate is high, you can reduce the overall operating system crashes in your deployment by upgrading those drivers with a high crash rate. 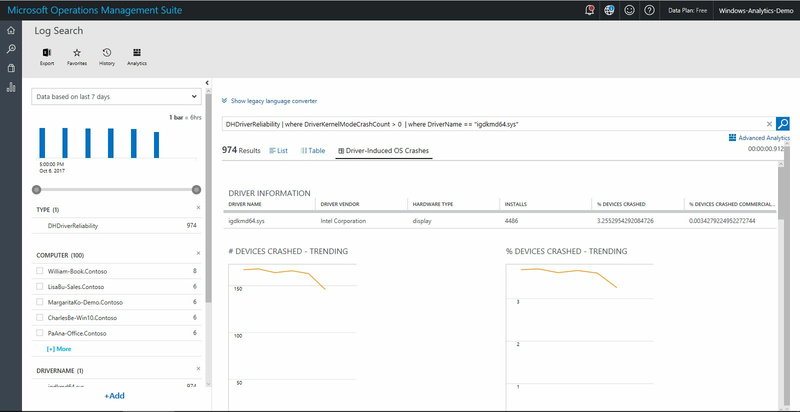 Clicking a listed driver on the Driver-Induced OS Crashes blade opens a driver perspective view, which shows the details for the responsible driver, trends and commercial averages for that driver, and alternative versions of the driver. 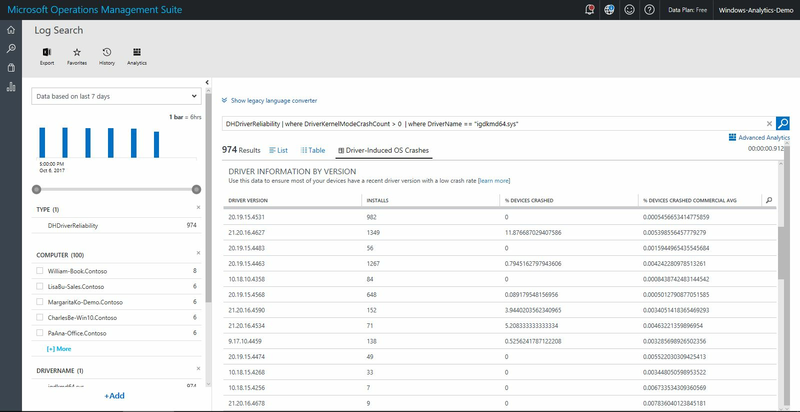 The driver version table can help you determine whether deploying a newer version of the driver might help you reduce the crash rate. In the example shown above, the most commonly installed driver version (19.15.1.5) has a crash rate of about one-half of one percent--this is low, so this driver is probably fine. However, driver version 19.40.0.3 has a crash rate of almost 20%. If that driver had been widely deployed, updating it would substantially reduce the overal number of crashes in your organization. 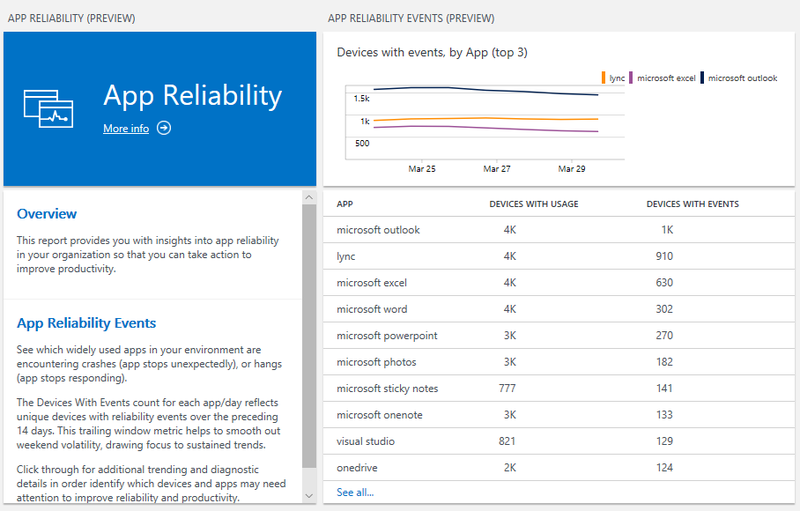 The App Reliability report shows you useful data on app usage and behavior so that you can identify apps that are misbehaving and then take steps to resolve the problem. The default view includes the Devices with events count, which shows the number of devices in your organization that have logged a reliability event for a given app over the last 14 days. A "reliability event" occurs when an app either exits unexpectedly or stops responding. The table also includes a Devices with Usage count. This enables you to see how widely used the app was over the same period to put the Devices with Events count into perspective. % with events: the ratio of "devices with events" to "devices with usage"
% with events (commercial average): the ratio of "devices with events" to "devices with usage" in data collected from deployments with a mix of operating system versions and device models that is similar to yours. This can help you decide if a given app is having problems specifically in your environment or more generally in many environments. With these trend graphs you can more easily detect if an issue is growing, shrinking, or steady. The trend graph on the left shows the number of devices that logged any reliability event for the app. The trend graph on the right shows the ratio of "devices with events" to "devices with usage." Trailing window: in this line, each day’s value reflects reliability events that occurred in the 14 days leading up to that day. This is useful for gauging the long-term trend with reduced volatility due to weekends and small populations. Single day: Each day’s value reflects reliability events that occurred in a single day. This is useful if an issue is quickly emerging (or being resolved). This table breaks out the metrics by combinations of App and OS version. This enables you to identify patterns in that might indicate devices needing an update or configuration change. For example, if the table shows that a later version of an app is more reliable than an earlier version in your environment, then prioritizing deployment of the later version is likely the best path forward. 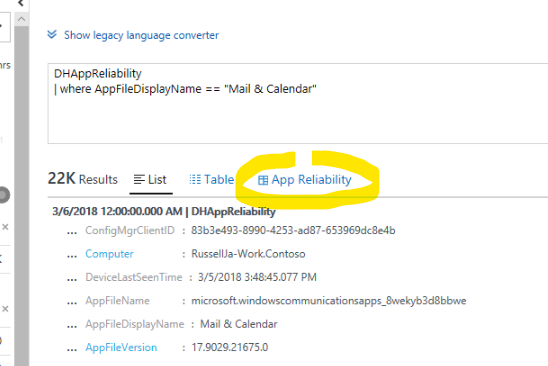 If you are already running the latest version of the app, but reliability events are increasing, then you might need to do some troubleshooting, or seek support from Microsoft or the app vendor. By default the table is limited to the most-used version combinations in your environment. To see all version combinations click anywhere in the table. This table shows the most detailed information. 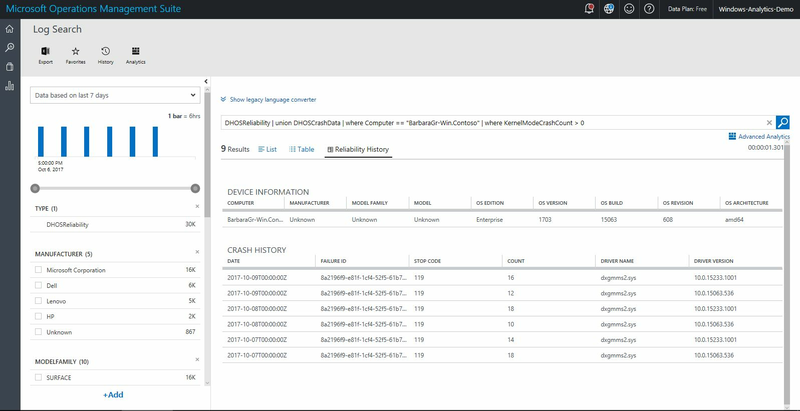 Although Device Health is not a debugging tool, the details available in this table can help with troubleshooting by providing the specific devices, versions, and dates of the reliability events. This view also includes the Diagnostic Signature column. This value can be helpful when you are working with product support or troubleshooting on your own. The value (also known as Failure ID or Failure Name) is the same identifier used to summarize crash statistics for Microsoft and partner developers. The Diagnostic Signature value contains the type of reliability event, error code, DLL name, and function name involved. You can use this information to narrow the scope of troubleshooting. For example, a value like APPLICATION_HANG_ThreadHang_Contoso-Add-In.dll!GetRegistryValue() implies that the app stopped responding when Contoso-Add-In was trying to read a registry value. In this case you might prioritize updating or disabling the add-in, or using Process Monitor to identify the registry value it was trying to read, which could lead to a resolution through antivirus exclusions, fixing missing keys, or similar remedies. By default the table is limited to a few recent rows. To see all rows click anywhere in the table. Why does a particular app not appear in the views? Filter out background processes which have no detected user interaction. Filter out operating system processes which, despite having user interaction, do not feel like apps (for example, Logonui.exe, Winlogon.exe). Known limitation: Some processes which may feel like apps are not currently detected as such (and are therefore filtered out as OS processes). These include Explorer.exe, Iexplore.exe, Microsoftedge.exe, and several others. Remove apps which are not widely used in your environment. Known limitation: This might result in an app that you consider important being filtered out when that app is not among the 30 most widely used in your environment. We welcome your suggestions and feedback on this filtering process at the Device Health Tech Community. Why are there multiple names and entries for the same app? For example, you might see Skype for Business, ‘skype for business’, and Lync listed separately, but you only use Skype for Business. Or you might see MyApp Pro and MyApp Professional listed separately, even though they feel like the same thing. Apps have many elements of metadata which describe them. These include an Add/Remove programs title (“Contoso Suite 12”), executable file names (“ContosoCRM.exe”), executable display name (“Contoso CRM”), and others. App publishers (and in some cases app re-packagers) set these values. For the most part we leave the data as set by the publisher which can lead to some report splitting. In certain cases we apply transformations to reduce splitting, for example we (by design) convert many values to lower case so that incoming data such as "Contoso CRM" and "CONTOSO CRM" become the same app name for reporting. To work around this, click the App Reliability tab above the results to see the expected view. DHAppReliability | where AppFileDisplayName == ""
DHAppReliability | where AppFileDisplayName == "Microsoft Outlook"
Login Health provides reports on Windows login attempts in your environment, including metrics on the login methods being used (such as Windows Hello, face recognition, fingerprint recognition, PIN, or password), the rates and patterns of login success and failure, and the specific reasons logins have failed. The Login errors blade displays data on the frequency and type of errors, with statistics on specific errors. They are generally categorized into user-generated (caused by bad input) or non-user-generated (might need IT intervention) errors. Click any individual error to see all instances of the error's occurence for the specified time period. The Login metrics by type blade shows the success rate for your devices, as well as the success rate for other environments with a mix of operating system versions and device models similar to yours (the Commercial average success rate). In the table (by type) you can gauge how broadly each login type is attempted, the number of devices that prefer the type (most used), and the success rate. If migration from passwords to an alternative such as Hello: PIN is going well, you would see high usage and high success rates for the new type. This view shows trends over time of usage, preferred credentials, and success rate along with the most frequent errors and frequently failing devices for that login type. The filters in the left pane allow you to filter errors to a particular operating system, device model, or other parameters. Alternatively, clicking the most frequently failing models from the Login Health perspective will take you to a list of error instances filtered to the login type and specified device model within the specified time range. Windows Hello: Face authentication errors are not currently included in the login health reports. Windows Information Protection (WIP) helps protect work data from accidental sharing. Users might be disrupted if WIP rules are not aligned with real work behavior. WIP App Learning shows which apps on which computers are attempting to cross policy boundaries. 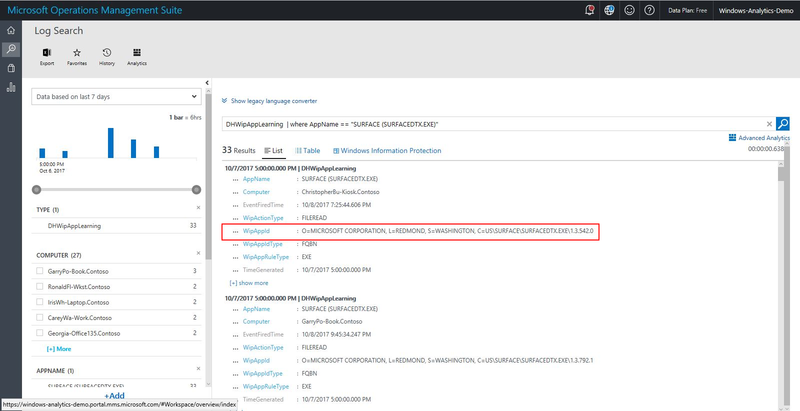 For details about deploying WIP policies, see Protect your enterprise data using Windows Information Protection (WIP). Reduce disruptive prompts by adding rules to allow data sharing from approved apps. Tune WIP rules, for example by confirming that certain apps are allowed or disallowed by current policy. 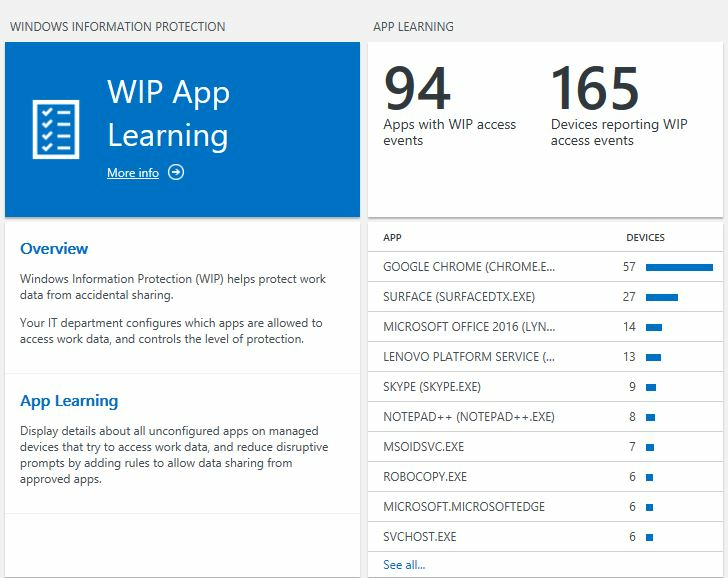 Clicking through the APP LEARNING tile shows details of app statistics that you can use to explore each incident and update app policies by using AppLocker or WIP AppIDs. Here you can copy the WipAppid and use that for adjusting the WIP policy. All of the views and blades display slices of the most useful data by using pre-formed queries. 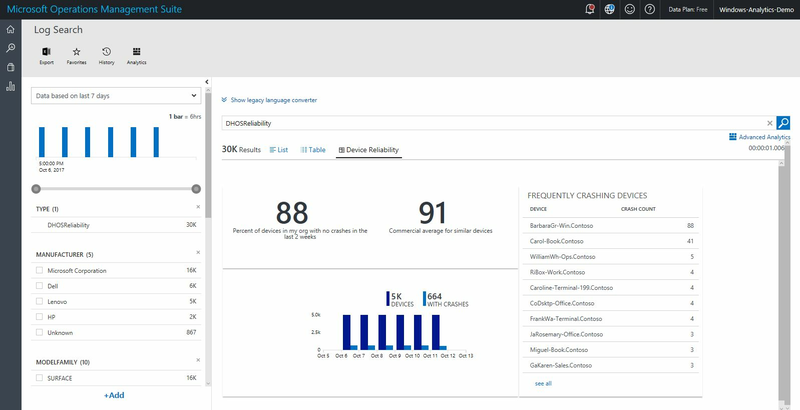 You have access to the full set of data collected by Device Health, which means you can construct your own queries to expose any data that is of interest to you. For documentation on working with log searches, see Find data using log searches. This topic section provides information about the data types being populated specifically by Device Health. After running a query, make sure to set the date range (which appears upper left after running initial query) to "7 days" to ensure you get data back. If you see the search tutorial dialog appearing frequently, it's likely because you are have read-only access to the Azure Portal workspace. Ask a workspace administrator to grant you "contributor" permissions (which is required for the "completed tutorial" state to persist). If you use the search filters in the left pane, you might notice there is no control to undo a filter selection. To undo a selection, delete the (FilterName="FilterValue") element that is appended to the search query and then click the search button again. For example, after you run a base query of Type = DHOSReliability KernelModeCrashCount > 0, a number of filter options appear on the left. If you then filter on Manufacturer (for example, by setting Manufacturer="Microsoft Corporation" and then clicking Apply), the query will change to Type = DHOSReliability KernelModeCrashCount > 0 (Manufacturer="Microsoft Corporation"). Delete (Manufacturer="Microsoft Corporation") and then click the search button again to re-run the query without that filter. Trend of App Learning activity for a given app. 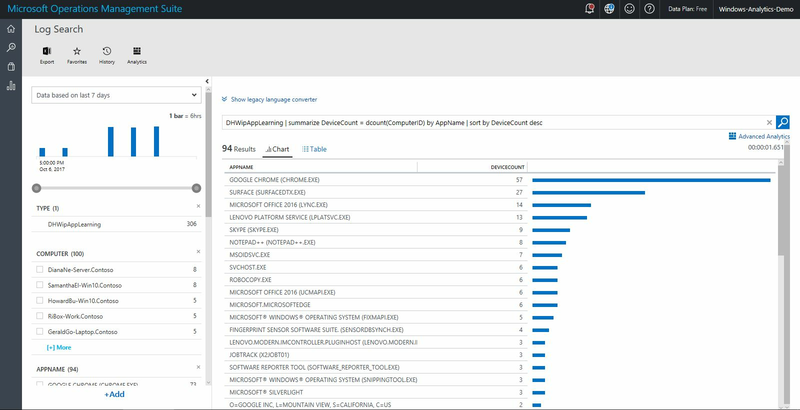 Useful for tracking activity before and after a rule change Type=DHWipAppLearning AppName="MICROSOFT.SKYPEAPP"
Azure Portal enables you to export data to other tools. To do this, in any view that shows Log Search just click the Export button. Similarly, clicking the Alert button will enable you to run a query automaticlaly on a schedule and receive email alerts for particular query results that you set. If you have a PowerBI account, then you will also see a PowerBI button that enables you to run a query on a schedule and have the results automatically saved as a PowerBI data set.